This report has been prepared for a coalition of groups interested in preserving D.C. General Hospital and health centers in Washington, D.C. The members of the coalition are the Center for Community Change; the Committee of Interns and Residents, Service Employees International Union; and the National Union of Hospital and Health Care Employees, American Federation of State, County, and Municipal Employees. I have written this report myself and it represents only my own independent professional views. It has not been edited or approved by anyone else. This report rests in part on evidence presented in public testimony before the District of Columbia City Councils Subcommittee on Health and Human Services on Monday 18 September 2000, updated with supplementary information on 22 September 2000. Disclaimer: As always, I write and speak only for myself, not on behalf of Boston University or any of its components. A. The Loss of Hospitals in the Eastern Half of Washington, D.C.
Today, D.C. General Hospital presents many financial, medical, staffing, physical plant, political, and other problems. renewing and reforming the hospital with the right services and number of inpatient beds, but that would require complex, highly-charged, sustained, and costly efforts. If a closing is not safe, and if a CAH is not possible, then the only remaining choice possible is to renew and reform the hospital. This is not an easy choice. If it were easy, the future of the hospital would have been successfully resolved years ago. But please dont agree with those who have despaired or would bail out. Instead, go the distance. The hospitals crises create opportunities, as more people are willing to be part of a comprehensive compromise reform solution. Closing the hospital is unacceptable because too many patients will be hurt. And converting it to a CAH cannot work because it is simply too complexadministratively, medically, and financially. When these impossible options are eliminated, what is left is what must be done, however difficult it may seem today. On balance, therefore, I strongly urge you to adopt the third alternative. For all its complexity and difficulty, I believe it is the safest for the people of the District who are vulnerable to deprivation of needed care. It is substantially better than a "Community Access Hospital" (CAH). I do not believe that renewing and reforming the hospital will be more expensive than the CAH, especially in light of the medical benefits that renewal and reform would offer. And for all its problems, it is much less of a gamble than the CAH would be. Renewing D.C. General requires reform so it works as efficiently as possible, as all hospitals should. This is not a leap into the unknownbut it is a tough job that will require hard and long work from smart, experienced, and dedicated people. The CAH, by contrast, would be a leap into the unknown. Right now, its two main attractions seem to be that it avoids the immediate political problems that closing D.C. General Hospital would bring, and it seems to present a magical last-minute solution that avoids the tough work of actually fixing D.C. General Hospital. But avoiding political problems or tough work is no solution. There is no free lunch in health care. Worse, while making the transition to a CAH is not as complicated as, say, the Normandy invasion of June 1944, it comes closeas medical reconfigurations go. It could be so difficult to make the transition to a CAH that D.C. General Hospital could well be irretrievably destroyed in the processwith no assurance that substitute care is available. The CAH proposal could become a roller-coaster ride to a closing. This should not be allowed. The CAH proposal approved by the PBC constitutes the single most unrealistic, untested, and risky proposal I can recall seeing in the health care field. Renewing and reforming D.C. General Hospital is the most conservative approach of the three. It is appropriate to be conservative when lives are at stake. This approach thereby cleaves to the old medical admonition to "First, do no harm." This approach respects at least three important realities. Second, it respects the people of the District, and their need for health care that is located reasonably near where they live. It respects D.C. General Hospitals location in an area that has already lost many hospitals, and where few hospitals remain. Third, it respects the likely growing need for hospital and emergency room care in the years aheadwhen other financially distressed hospitals might close, and when greater numbers of older patients will need more hospital beds, not fewer. Renewing and reforming D.C. General Hospital, for all its difficulty, is probably the least risky and even the least expensivein money and livesof the three alternatives. Eight over-arching strategic steps should be taken to renew and reform D.C. General Hospital. Immediately abandon speculative, unproven, or imaginary solutions, such as a Community Access Hospital, which have not been demonstrated to work effectively or efficiently in cities. Treat the threat to the hospitals survival as the public health emergency it is. Secure all stakeholders commitment that D.C. General Hospital should, can, and will be renewed as a first-class hospital for first-class patients. Secure their commitment that everything necessary to attain that goal will be done. Appreciate that as much as three years will be needed. Go the distance. Return to the general course originally charted in the first and second Cambio reports to the PBC. Those reports, which rested on the current management teams detailed analysis of the problems of the D.C. General Hospital, described eight sets of recommendations for renewing and reforming the hospital. While the job of validating or invalidating any specific recommendation offered by Cambio is beyond the scope of this report, they do appear reasonable, taken together. If some parties disagree with some aspects of the report, the sources of those disagreements need to be candidly addressed and an agreement struck. Avoid playing a numbers game. The number of beds that D.C. General Hospital will set up and staff next month, next year, and next decade will depend on patients need for care and their willingness to seek care at D.C. General. This, in turn, will depend on such factors as insurance coverage, available of care at other institutions, and patient preference. But these are not now very predictable. Under conditions of uncertainty, contingency planning is necessary. Otherwise, money will be wasted or patients will be denied needed care. The hospital must therefore develop a flexible staffing plan, one that can efficiently respond to the needs of the patients the hospital should serve. As discussed shortly, in the section on physical condition, I recommend that the hospital defer building a new physical plant until the existing hospital is renewed and reformed. This will allow time to estimate future need, and it will allow patients to vote with their feet to be served at D.C. General Hospitalif the hospital is renewed and reformed. Prepare a detailed reform plan. Writing a detailed reform plan is beyond the scope of this report. It is the job of the hospitals administrationthe people who will be charged with implementing it. The reform plan for the hospital should build on the reports by Cambio and its consultants. The reform plan for the health centers should build on the Primary Health Care Services Assessment prepared by the Bureau of Primary Health Care. Set priority objectives. A great number of things must be done to renew the hospitalmany more things than can be done at one time: lower costs, higher revenue, improved quality, a new physical plant. Some of these must be launched immediately; otherssuch as a new buildingwill probably have to wait until the hospital is renewed medically and financially. Recruit the best available public hospital administrator (CEO) in the nation, and grant wide latitude to this person. Pay enough to attract and retain that person. Many non-profit urban hospitals CEOs are paid from one-half million dollars to over one million dollars yearly. And their jobs are typically not as hard as the job of running a public hospital. Similarly, recruit the best available chief operating officer, chief financial officer, and director of nursing in the nation. Pay them enough as well. Fully integrate their efforts with those of the current Cambio management. Obtain consultation from experts in turning around troubled hospitals, particularly public hospitals. Design and implement a plan to coordinate adequate primary care funding at the Districts clinics and health centers with the specialized ambulatory services, the inpatient care services, and the emergency room of a revitalized D.C. General Hospital. The Bureau of Primary Health Cares review of the PBCs health center program included a set of 20 specific recommendations to "improve operating efficiencies, expand its primary care base, expand related health services and improve the quality of care available to the Districts neediest citizens. "5 These recommendations rest on reviews of each health centers operations. As a set, they appear reasonable and useful. Renewing and reforming D.C. General Hospital requires much more than taking these eight strategic steps. It requires a great deal of prolonged and hard work to address the four problems detailed in Section I of this report. Strategic and political assessment (availability of other hospitals; perceived greater need primary care, prevention, insurance; and administrative feasibility of reform). The rest of this report spells out the evidence and the reasons why I urge you to go the distance and support the strategies that have been and are being developed to renew and reform D.C. General Hospital. Unless D.C. General Hospital is renewed and reformedeither in the ways suggested here or in alternative waysthe hospital can be expected to close. That will not be good for the health of the people who depend on the hospital, or on its associated health centers and clinics. And it will not be good for the people of the District or of the Washington metropolitan area. If D.C. General Hospital attracts patients in need of service, if it provides high quality care, if it is operated efficiently, and if it is well-integrated into a comprehensive system of ambulatory and inpatient care, it will attract the financial and political support required to keep it operating. By surviving as a revitalized and reformed institution, the hospital will provide health services that are essential to patients who are vulnerable to deprivation of needed care. political disengagement can reduce willingness to lower costs and raise revenue. Despite these important inter-relationships, each of the four groups of problems can be considered separately. Some believe that public hospitals are often less efficient. The D.C. General Hospital and its nine (now apparently eight) associated health centers were placed under the Public Benefits Corporation (PBC) in October of 1997. This was done in hopes of "freeing it from the citys contracting and procurement regulations and [of] allowing it to act more nearly like a private institution in the market. "6 But it does not seem that hoped-for efficiencies have fully materialized. A review of the PBCs eight health centers found over-staffing of some physicians and other specialists. On average, only 66.1 percent of available physician and mid-level clinician visit slots were filled from April 1999 through March 2000.8 Given the need for primary care in the District, this is frustrating. It is not clear whether this reduction was a response to a drop in patient volume, a reaction to long-standing over-staffing, or a hurried effort to cope with a looming financial emergency. Evidence of the revenue problem. The PBC has been generating substantially less revenue than it deserves to collect for serving patients with third-party coverage, particularly Medicaid coverage. For example, it is reported that over 90 percent of all claims to Medicaid from the eight PBC clinics have been denied in October 1999 and July 2000.10 Denials are attributed to failure to license all PBC health centers; use of PBC centers by Medicaid managed care patients who are enrolled elsewhere; failure to bill Medicaid on time; and billing for patients who not eligible. Clearly, the licensing and timely payment problems are fixable. Further, Medicaid apparently has been paying for care at PBC clinics at low rates of only $18-30 per visit, not the $133 per visit interim rate that Medicaid had approved. Possible causes of low revenue. History of weak hospital management. The hospital has had difficulty developing and implementing reliable systems for billing Medicare, Medicaid, HMOs, insurers, and other payers. The District has been unable to win a Medicaid waiver that would decrease the number of uninsured patients. Even though only about 11 percent of D.C. General Hospitals inpatients were covered by Medicare in 1999, the hospitals Medicare revenue has probably been held down by the provisions of the Balanced Budget Act of 1997. At the PBC community health centers, the low rate of payment from Medicaidcoupled with the high rate of denialsseems to be attributable to a mismanagement at the health centers and perhaps at Medicaid itself. According to one report, D.C. Generals emergency room is sometimes so crowded that frustrated patients "elope," leave to obtain care elsewhere.13 When these patients are insured, revenue leaves with the patient. High cost and low revenue mean a deficit. Unless the deficit is covered by District subsidies, D.C. General Hospital will not be able to pay its bills. It seems clear that the PBC will require additional public subsidies for the present fiscal year, no matter what course is taken, unless the D.C. General Hospital is closed outright without providing or financing substitute services for uninsured patients. The current quality of the hospitals clinical services may be good in some respects, but it is not good enough in other respects. Physicians who staff the PBCs own community health centers "reported that they lacked admitting privileges to D.C. General. "16 At the same time, most physicians asserted that they "failed to receive any follow-up communication" from referrals made to D.C. General Hospital. These two problems can undermine continuity of care. Complaints have been voiced regarding difficulty in scheduling appointments for D.C. General Hospitals specialty clinics. "The public clinics have had the same level of difficulty getting their patients into DCGH for specialty and tertiary care as the private clinics." Both have faced "long waiting times, and no follow-up and continuity of care. "17 This is not necessarily a problem of technical quality. Rather, it may be one of coordination of services, adequacy of services, adequacy of financing, or general administration. Evidence of poor physical condition. According to Ormond and Bovbjerg, "D.C. General has suffered from years of inadequate maintenance and capital investments and needs major renovation. "18 The hospitals run-down physical condition is well-known and questioned by none, so it does not require detailed documentation here. Beyond this is the problem of physical plant configuration that is ill-suited to the scale of the hospitals current operations. Viewed from the outside, the present facility may not be greatly changed from that which housed some 1,400 patient beds in the late 1940s and early 1950s.19 The result is a facility that is too large and too costly to maintainand one that is not compact enough to allow for efficient staffing. Possible causes of poor physical condition. D.C. General Hospital is not alone in its poor physical condition. Large-city American public hospitals tend to suffer from inadequate investment in improvements or repairs. Witness the deterioration of Chicagos Cook County Hospital, Philadelphia General Hospital, St. Louiss Homer G. Phillips, New Yorks Kings County Hospital, and many other institutions. Local governments erect large institutions at considerable cost, and then have tended to use their available financial resources to cover operating deficits associated with care of uninsured patients. In some cities, capital to renew public hospitals has competed with health centers own capital needs. ; renovations to the hospital itself are being funded out of operational savings. "20 It is not clear whether hoped-for operational savings materialized. (availability of other hospitals; greater need for primary care, prevention, insurance; and administrative feasibility of reform). D.C. General is not needed. Use of the hospital has declined in recent years. Good primary care and prevention will mean even less need for the hospital. Empty beds are available elsewhere. And moving D.C. General Hospitals patients to other hospitals will help to stabilize and retain other hospitals vital to the residents of the District. Money that is now being spent to sustain D.C. General and money that would have to be spent to stabilize and renew the hospital would be better spent by preventing more problems through better ambulatory care. It could be devoted to increasing payments to health centers and clinicssome closely affiliated with the hospital and some that are not. Money that would have to be spent to stabilize the hospital would be better spent by providing health insurance coverage to people who are vulnerable to deprivation of needed care. It would cost too much to renew the hospital. The cost of a new building would be too great. And it would be too hard to work with doctors, nurses, and other employees to shape an affordable pattern of care. After considering some or all of these four individual elements of finance, quality, physical condition, and strategic/political assessment, many people have concluded that D.C. General Hospital is too far gone. For some critics of the hospital, conclusions rooted partly in these four individual problems seem to be tied to an unsympathetic over-arching or global view of D.C. General. This view may be rooted in part in a belief that a public hospital cannot be run well, in a belief that a hospital that serves minority or low-income citizens cannot be a good hospital, in a belief that a unionized hospital cannot be an efficient hospitalor in a perception that this hospital simply does not work as well as a real hospital should work. The different criticisms of D.C. General originate in beliefs about one or more of the four specific problems, or in the over-arching view just described. No matter where they originate, they conclude by asserting that the hospital that it must be either closed or radically re-shaped as a "Community Access Hospital" (CAH). They conclude that D.C. General Hospital is too broken to be fixedthat anything has got to be better than keeping this hospital open. But those who say "anything has got to be better" can easily find ways to make things worse. That is because they are so convinced that anything else must be better that they fail to scrutinize carefully the different alternatives. In this section, we consider the evidence indicating that closing D.C. General Hospital is not safe. This is important to do because the hospital could very easily be closed within the next six to eighteen months. It is important because it appears that some individuals would privately prefer that the hospital close, though few people publicly advocate an outright closing imminently. It is important because of the very high likelihood that pursuing the Community Access Hospital Proposal will quickly lead to a complete closing of the D.C. General Hospital. because it would mean worse shortages in the future. The need for hospital care in the District will grow in years to come, so closing D.C. General will deprive the District of the right hospital in the right place, worsening the looming shortage of hospital beds to serve the people of the eastern half of the District. the need for the hospital in the years to come. Closing the hospital is discriminatory. It is dangerous to the health of the public by all three criteria. Examining this evidence requires considering both space and time. Lets first examine spacewhere the hospital is located today, the communities it serves, the services it provides, and the locations and survival prospects of other hospitals. It is important to retain needed hospitals and emergency rooms near where people live today, and also where they will be needed tomorrow. A look at a map helps to show D.C. General Hospitals current importance in the city. Doing so requires considering the past six decades legacy of closing or relocating hospitals from African-American neighborhoods of the District. The first map identifies hospitals locations. 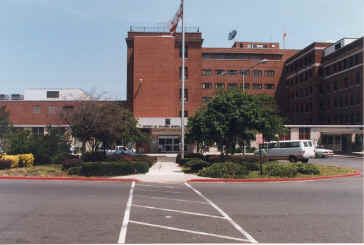 D.C. General Hospital is number 7, as shown in the "Key to Washington, D.C. Hospitals" following the first map. This map shows that D.C. General Hospital is the only surviving institution in the eastern half of Washington, with the exceptions of the Greater Southeast-Hadley hospitals, now run for-profit by Doctors Community Healthcare Corporation, and of Providence Hospital. Central Dispensary/Emergency on New York Avenue closed in the 1950s, removing 310 beds. Providence relocated from near Capitol Hill in the 1950s, moving 297 beds. Sibley relocated from North Capitol Street in the 1960s, moving 248 beds. Several other smaller hospitals closed or converted to other uses. As a result, some 1100 beds in five hospitals were removed from the heart of the eastern half of the district. This map shows the importance of D.C. General Hospital as a surviving caregiver for a large expanse of the District and its citizens. The map shows that Greater Southeast and Howard University hospitals are both about three miles from D.C. General Hospital. D.C. General Hospital would be even more important if, for example, Greater Southeast were to close. As a public hospital, D.C. General has been able to remain open in the face of trends that have removed most of the other hospitals in the eastern half of the District. As a public hospital, D.C. General has claims on public dollars that other hospitals do not and would not. Visual inspection of the second map shows the close association between community race in 1990 and closing or relocation of hospitals in earlier decades. This association is not restricted to Washington, D.C.
One long-standing reality, which I have found in 52 U.S. citiesdecade after decade since the first data were available in 1936is that hospitals located in African-American neighborhoods, are significantly more likely to close, even after controlling for other factorssuch as efficiency, teaching status, and the like. As shown in Exhibit 1, on the preceding page, residents of neighborhoods with high minority (African-American plus Hispanic) population shares in 1990 were much more likely to have lost hospitals located in those neighborhoods. We found a fairly regular and consistent relation between the 1990 minority share of the people residing around a 1936 hospitals location and its chances of survival. For example, as the following table displays, while almost half of the 171 hospitals open in 1936 in neighborhoods under 20 percent African-American or Latino in 1990 remained open in 1997, only about 30 percent of hospitals located in neighborhoods 80 percent or more minority remained open in 1997. We found the same general pattern for hospitals ever open at any time between 1936 and 1997. And we found the same for hospitals open in 1980. The evidence on the high level of use of the hospital suggest that it is needed. In 1999, this meant that D.C. General Hospital provided 14 percent of the Districts ER visits. Further, D.C. General Hospitals share of the actual cost of uncompensated care is substantially greater than these data would suggest. If we assume that each hospital measures uncompensated care costs at average cost, then D.C. Generals costs accurate the actual burden of that cost on the hospital. But at hospitals that provide relatively small amounts of uncompensated care, it is much more appropriate to measure the cost of uncompensated care at marginal or incremental cost, which is substantially lower than average cost. Use of the hospitals inpatient beds rose substantially between 1995 and 1999. So the hospital seems to be becoming more useful, not less useful. Admissions rose by 5.7 percent, to just over 10,000 admissions. This was the largest rise among all of the Districts hospitals. This increase contrasts with drops at some other nearby hospitals. Greater Southeast lost 12.3 percent of its admissions; Hadley Memorial lost 5.7 percent, and Howard University lost 2.5 percent. These use data show the importance of the hospital. It is helpful to appreciate that hospitals are not inter-changeable parts in some health care machine. Patients make the best choices they can in todays world. Patients go to D.C. General Hospital today for good reasons of their own. Many of the Districts estimated 80,000 uninsured patients have particularly strong reasons. And the number of uninsured citizens of the District has remained high, even during very good economic times.28 While it is decent and proper to talk about expanding Medicaid eligibility and designing new insurance options, doing so can be difficult. More than inpatient care is involved. Nationally, in 1996, African-American citizens depended twice as heavily on hospitals to organize and deliver ambulatory care (32 percent of their ambulatory care visits were in hospital ERs or OPDs) as did white citizens (15 percent).30 Washington, D.C. may or may not have too many hospital beds (much depends on whether we count licensed beds or beds actually set up and staffed, as discussed elsewhere), but African-Americans heavy reliance on hospitals for ambulatory care obliges caution before disrupting existing arrangements. Heavy reliance on hospital clinics and ERs for routine primary care services is seldom optimal, but it is much better than no care at all. More satisfactory alternative arrangements should be put in place and tested and stabilized before existing patterns of care are dismantled or forced to undergo hasty reorganization. And would nearby hospitals have the physical capacity and the practical willingness to serve the patients who would be displaced if D.C. General Hospital were to be closed or reshaped into a CAH? Would nearby hospitals be willing and able to provide the emergency room capacity, the inpatient care, the ambulatory care, and the specialized services (such as dental, orthopedics, burn, or trauma care) required by displaced patients? Would nearby hospitals have the financial capacity to serve patients displaced from D.C. General Hospital? Were D.C. General Hospital to close, the financial stress on manyand perhaps mostremaining District hospitals would almost certainly grow. One reason is that, as shown elsewhere, only 39.6 percent of D.C. General Hospitals inpatientsonly two patients in fiveare covered by either public or private insurance. A second reason is that the added costs of uncompensated care are likely to exceed added revenue from the District government (to provide services under contract) or from private third parties (owing to surviving hospitals stronger bargaining positions). Some of the Districts other hospitals could close as a result. Source: District of Columbia Hospital Association, 1999 DCHA Annual Survey. * Note: Howard University Hospital was originally reported to gain 1.1 percent on operations in 1998, but new data from the 1999 D.C. Hospital Association show a loss of 23.2 percent in 1998. The finances of some hospitals in the District may have improved since 1999, particularly those of Greater Southeast Community Hospital, while others may have deteriorated. Additionally, George Washington University and Greater Southeast Community/Hadley hospitals have been bought by for-profit hospital corporations. If those corporations are unable to earn substantial rates of return on their invested equity, they should be expected to sell, convert, or even close hospitals they own. Looking beyond the hospital-to-hospital variation, it is important to note that the Districts acute care hospitals, taken as a group, were not in good financial condition in 1999. When we consider all the acute care hospitals of the District, and compare their finances with those of hospitals in Maryland and Virginia, a similarly bleak picture emerges, as shown in Exhibit 3. Here, total margins for 1998, the latest available, are reported. These include non-operating revenues, such as income on endowment. The Districts acute care hospitals financial margins were only 29 percent as high as Marylands, and only 14 percent as high as Virginias. Some have said that a great deal of money could be saved by closing D.C. General Hospital, or by re-shaping it into a CAH. They have suggested that the savings could be devoted to insuring people who are currently uninsured, so they could use other hospitals. But this raises several questions. First, how much money would be saved by closing D.C. General Hospital or by re-shaping it into a CAH? Second, would the savings be adequate to insure all the patients now served by D.C. General Hospital, or to finance their care at a CAHand also to pay for needed contracted emergency room and specialist physician and inpatient care services at other hospitals and facilities? Third, the draft proposal approved by the PBC "anticipates being able to provide the equivalent of health insurance for the current uninsured population served by D.C. General. "35 This language appears to exclude both currently uninsured people who are not served (or who are not acknowledged to be served) by D.C. General Hospital, and people who lose their insurance in the years ahead. Fourth, where would uninsured patients obtain needed inpatient and outpatient care once D.C. General Hospital was closed or re-shaped into a CAH? What are the assurances that care at other hospitals would continue to be paid foror even that those other hospitals would remain open? Fifth, maintaining D.C. General Hospital as a full-service acute care hospital constitutes a political mortgage on the District governmenta claim for money with which to serve uninsured patients and other patients who are vulnerable to deprivation of needed care. Any government that is short of money might resent such a mortgage, and try to pay it off. Today, the District might promise to pay other hospitals for services now provided at D.C. General, but the District might not be able to willing to keep that promise. So tomorrow, it could blame private hospitals for failing to spend the Districts money well, or for failing to provide good care. The complexity of the CAH proposalwith its difficult demands for negotiating contracts, enforcing contracts, maintaining accurate records of referrals, and billing and paying for services providedoffers many reasons or opportunities for cutting District payments to contracting private hospitals. Sixth, even if citizens were given insurance cards, would the rates of payment be adequate to persuade doctors and hospitals to provide care? It is one thing to put in place contractual provisions; it is another thing to enforce them. Seventh, if the new insurance were cancelledor if eligibility or payment rates were cut backduring the next recession and resulting District fiscal crisis, where would patients get care? Providing insurance for all is a decent and worthy goal. But the rhetoric of offering insurance tomorrow (like the rhetoric of prevention) should not be used, even unintentionally, as a smokescreen behind which needed care is withdrawn today. It should not be used, even unintentionally, to grease the skids for closing D.C. General Hospital. Uninsured patients need guarantees and carefully designed reforms, not promises or hastily sketched proposals. Eighth, it is vital to provide all residents of the District with first class ambulatory care and in-hospital care. Ambulatory care should include primary care by physicians, nurse practitioners, and other clinicians. It should include specialty care by board-certified or board-eligible physicians. In-hospital care should include routine secondary inpatient care for the ordinary problemssuch as appendicitis, a broken leg, or pneumoniaand the specialized tertiary problemssuch as open heart surgery, organ transplantation, or radiation therapy for a brain tumorthat require admission to a hospital. When health care works well, ambulatory care and in-hospital care are not enemies of one another. They are allies. First class health care requires good primary care. But it also requires easy referral to specialists, easy access to lab work and radiology, and easy access to in-hospital care when needed. Smoothly-working health care ensures coordination of care across different kinds of doctors, and across different sites of care. And it ensures continuity of care over time. In practice, coordination and continuity require smooth relations among all clinicians and organizations involved, adequate financing for all needed services, easily integrated medical records, and appropriate hospital admitting privileges for qualified physicians. Primary care is not the enemy of specialized care. Ambulatory care is not the enemy of hospital care. All are needed if lives are to be saved. The painful, heartbreaking, and frustrating case of a Washington, D.C. resident who was denied timely and appropriate care was described vividly in the September 2000 issue of Consumer Reports.36 This case shows the importance of improving coordination and continuity of care for uninsured patients. And it shows the importance of retaining D.C. General Hospital as the hub of a network of primary care practices. For if this hospital were to close, which other hospitals would be willing and able to forge the links of care with the Districts clinics and health centers? In recent decades, some experts have argued that the U.S. had built too many hospital beds, and that closing beds was a sensible way to save money. Indeed, some hospitals had built too many beds. But my evidence indicates that urban hospitals that closed were, on average, somewhat less expensive and more efficient than the survivors. Survivors tended to be larger teaching hospitals, hospitals with more money in the bank, and hospitals located in non-minority communities. Someone called this "survival of the fattest," not survival of the fittest. Closing hospitals has been over-sold as a method of saving money in health care. Some might assert that the District has too many hospital beds today. But this may depend largely on whether licensed beds or beds actually set up and staffed are counted. In calendar year 1999, an 2,117 patients occupied beds at the Districts 11 acute care hospitals on an average day.37 Few hospitals today set up and staff beds that are likely to be empty. If the Districts hospitals set up and staff beds to achieve an average occupancy rate of 85 percenta reasonable safety marginthey actually set up and staffed some 2,490 beds on an average day in 1999.38 Dividing that figure by an estimated District population of 519,000 in 199939 yields an average of 4.8 set up and staffed beds per 1,000 District residents. When we allow for the substantial number of patients who live outside the District but obtain inpatient care within the District, this is not an unreasonable number. The first signs of hospital crowding are becoming very visible in many cities. Hospitals from coast-to-coast have complained of ER gridlock during the past few flu seasons. And this year, some hospitals are voicing similar complaints even in warm weather. Once a hospital is closed, it is usually impossible to re-open it. That is partly because it would be too costly to reassemble and reorganize an adequate staff, and partly because re-opening a hospital usually requires very costly capital investment to meet the current building and life safety codes. Closing too many hospitals and beds today will therefore require costly building projects tomorrow. If the nation liked bailing out the S&Ls for $500 billion, it will love replacing a thousand or so closed hospitals at a cost of $1 million per bed. As mentioned earlier, D.C. General Hospitals importance would be even greater if one or more of the remaining nearby hospitals were forced to close, or to restrict services, in coming years. Some would argue that closing or substantially down-sizing D.C. General Hospital would tend to financially buttress other nearby hospitals. Right now, that is only an interesting theory about the future. The reality would depend on the numbers and types of patients who actually went to surviving hospitals, the costs of treating them, and the public and private revenues they provided. A competing interesting theory about the future is that closing D.C. General Hospital would tend to financially stress other nearby hospitals, resulting in a domino effect. Health care for the citizens of the District is too important to rest on theoretical arguments. Citizens and patients need assurances, guarantees, and commitments, not theory and promises. Guaranteeing health care to District patients who are vulnerable to denial of needed services means stabilizing, renewing, and reforming a hospital like D.C. General Hospitala hospital that is located where it is needed, that will be needed even more in the futurewhen the population ages and if other hospitals in the District close. An enormous number of urban hospitals have closed throughout the nation in recent , I have found. So many hospitalsparticularly those located in African American neighborhoodshave closed that hospital should be considered valuable unless demonstrated otherwise. Consider the closing of Detroit Mercy hospital this summer to see what happens when one of these surviving hospitals closes.41 That is, the burden of proof should be on those who would close a hospital. a DC Qualified Health Center (DCQHC), with primary care, with disease management and prevention for diabetes and cardiovascular problems, with preventive dentistry, and possibly with certain specialty clinics; but other "chronic and specialty care will be provided through contracts with other providers and facilities." The PBCs proposal "anticipates being able to provide the equivalent of health insurance for the current uninsured populations served by D.C. General." This would be done by giving cards to people lacking insurancecards that would entitle them to services at the proposed CAH and at contracting providers. The PBCs proposal also mentions the Districts hope of expanding Medicaid. The PBC asserts that its proposal is "manageable within the current PBC subsidy." But it does expect that unquantified transition funding will be required. The PBC expects that aligning the current D.C. General Hospital into the CAH and the DCQHC, preparing referral and contracting arrangements, preparing eligibility-determination systems, designing and testing needed payment systems, and obtaining needed regulatory approvals can all be accomplished by 1 January 2001. To some, the CAH proposal may appear feasible and desirable. It may appear to be a medically, financially, and politically palatable alternative to closing D.C. General Hospital. It would seem to avoid the hard, slogging work of renewing and reforming D.C. General Hospital. But the evidence supporting the feasibility of the CAH is grossly insubstantial. Despite assertions to the contrary, no such method of care has been implemented in the United States. The proposed timetable for implementing the CAH is so short that it constitutes a recipe for financial, administrative, and possibly medical disastersdisasters that would discredit all those responsible for them. Further, it appears that the staff time and expertise needed to design and test the CAHand get it up and running on scheduleare simply not available. The PBC Board apparently voted to support the CAH proposal without first securing evidence on its medical safety, its financial feasibility, or its capacity to meet the medical needs of the uninsured and patients currently served at D.C. General Hospital. If this is so, the PBCs vote is premature at best and reckless at worst. The PBCs Board seems to have ratified a top-down planning process, one that appears to have sought little participation from other stakeholderssuch as patients, employees, and the communities served by D.C. General Hospital. Performing these eleven steps quickly, competently, and safely is enormously difficult. I am surprised that anyone could expect them to be accomplished in anything like the time contemplated with the human, financial, software, information systems and other resources likely to be available. Therefore, while each of the two sentences may be true, individually, they are simply not connected, either logically or substantively. Joining them in the same paragraph leaves the false impression that research into the Philadelphia, Fairfax, and Illinois cases support the feasibility of a freestanding ER. Any investigations in these three jurisdictions should have revealed striking differences from what is proposed for D.C. General Hospital. These differences are so striking that the Fairfax, Philadelphia, and Illinois examples should not be considered to offer relevant evidence regarding the medical safety, financial feasibility, or managerial feasibility of the CAH plan for D.C. General Hospital. Perhaps most important, the Philadelphia and Fairfax emergency rooms, and the two Illinois emergency rooms, while physically freestanding, are actually owned by and fully integrated with large and strong hospital systems. They are not organizationally freestanding, as the CAH would be. Further, three of the four facilities are located in relatively affluent suburban areas, while the fourth serves a wide cross-section of an urban community. All four of these examples are incorrectly cited as precedents for the CAH proposal because all four are fully integrated into large and relatively strong hospital systems. The challenges that the CAH will facein arranging referrals, in coordinating among physician, ER, and inpatient care, in billing, in payments, in coordinating medical records, and the likeare much smaller in a fully integrated system. Three of the four freestanding ERs serve affluent suburban areas, and one is a large teaching hospital that serves a broad cross-section of city residents and suburbanites. Recently, the state of New Jersey has offered some support for free-standing emergency rooms, but these "must be part of a system with nearby acute care hospitals." The emphasis would be on rural areas.55 The plans under consideration in New Jersey also fail to provide support for the CAH proposal. The CAH proposal, therefore, is without precedent. It is not right to ask that vital services for people vulnerable to denial of needed care by the objects of risky experiments. A hospital for under-served low-income urban citizens should not be one of the nations institutional guinea pigs. One of the many benefits of operating a freestanding ER as part of a strong, well-financed, reasonably well-functioning, and integrated system of care serving a wide cross-section of the community is that many of the fixed costs of operating a freestanding ER particularly all of the administrative functions of billing, central administration, payroll, ordering supplies, and the restcan be spread among the entire system. Expertise is at-hand in all areas. Unit costs are reduced when these fixed costs can be spread over a variety of needed services, such as acute inpatient care, and ambulatory care. By contrast, in the CAH proposal for the District, the high fixed costs that must be incurred to provide emergency carelaboratories, radiology, critical care unit, and the likewill have to borne entirely by the CAH. They could not be shared across a genuine inpatient services. This can make a CAH very costly. Further, when a freestanding ER does operate under the license of a strong hospital, legal and reimbursement issuesthose that must be settled before a freestanding ER can be paid for servicesmight be easier to resolve. Despite this advantage, those who would try to imitate any aspect of the Germantown  Albert Einstein experience should note that Germantown apparently suffers ongoing licensure problems with the Pennsylvania Department of Health. And the Bolling Brook facility required a legislative over-ride of Illinois Department of Health opposition to a freestanding ER. The CAH proposal for D.C. General, would not make for an integrated system under one ownership and management. Instead, the CAH proposal calls for complicated referrals of patients among different hospitals and other facilities. The CAH would serve many low-income patients, many of whom are vulnerable to deprivation of needed care and some of whom suffer from more than one medical problem. All of the costs of the CAH would have to be borne by the CAH. There would be little opportunity to spread fixed costs. How will clinical care be coordinated when a patient receives some services at the CAH, other services at another hospitals ER and inpatient facilities, and still other services from specialist physicianspossibly located elsewhere? Coordination of care and continuity of care are likely to suffer. Patients and their problems could fall through the cracks in the system, or be caught in webs of incomplete or inaccurate eligibility, medical records, or other information. Billing, eligibility determination, and medical records will be difficult to coordinate. And many other hospitals in the District suffer substantial financial problems, as discussed elsewhere in this report. The Fairfax County, Philadelphia, and Illinois arrangements are so different from the CAH that is proposed for D.C. General Hospital that it is very surprising that they are presented as support for the CAH proposal. The CAH proposal approved by the PBC is very ambitious, untested, complicated, hasty, and rushed. I can recall nothing like it. I find it inconceivable that the necessary elements and systems could be designed, tested, and implemented in the few months remaining before 1 January 2001. There has been little time to flesh out the idea. There has been little time to address, in detail, the eleven sets of tasks just listed. The Commissioner of Health has said, as noted earlier, that he and his staff have been working under very serious stresses of time and resources. And there has been almost no time to test them to see how they work in practice. Even if the CAH idea is the right one for this hospitaland it does not seem to beit is being pursued too quickly to do it right. Perceived unreliability. And it is being pursued by an entity closely linked to the Districts government. Given "the historical unreliability of the District government as a payer or partner",58 it is hard to see how the hospitals, health centers, and physicians of the District will be comfortable in investing in or committing to doing all the work needed at their end to make the CAH work. The PBC and the District would need to make a durable commitment to the CAHs partners in order to overcome the District governments perceived unreliability. Cost. The PBC asserts that its proposal for a CAH is "manageable within the current PBC subsidy." But it does expect that unquantified transition funding will be required. This is a very troubling set of assertions. It does not seem possible to estimate the cost of subsidizing the CAH without much more detailed plans than were available in mid-September when the PBC Board voted for the CAH. Without detailed plans, the claim that the current subsidy is adequate can be dismissed as unsubstantiated. The failure to quantify the transition costs is equally troubling. Disruption of emergency care. In written testimony submitted to District of Columbia City Councils Subcommittee on Health and Human Services on Monday 18 September 2000, the District of Columbia Hospital Associations president, Robert A. Malson, asserted that "Hospitals have already experienced problems with ambulance rerouting, not only because of emergency room overcrowding, but also because of clogged operating rooms and intensive care units. "59 Mr. Malson said that from November 1999 to March 2000, there were frequently no empty medical-surgical beds set up and staffed in District hospitals. For all of these reasons, the CAH proposal violates the long-respected injunction on doctors to "First, do no harm." This injunction makes enormous sense even when applied to a doctor who is treating one patient at a time. It makes even more sense to apply it to governmental agencies that are treating a hospital that serves 50,000 ER patients, 10,000 inpatients, and even more ambulatory clinic and health center patients annually. Even to contemplate moving to a CAH in a few months is surprising. To vote for it is shocking. To those who believe that renewing D.C. General is too costly, too difficult, or simply impossible, the CAH offers a new and cosmetically attractive alternative. As a new and vague idea, the CAHs costs are hard to quantify. The difficulties of implementing it hard to appreciate. To those anxious to save money for the District, the CAH promises to save money but avoids the appearance of an outright closing of D.C. General Hospital. To those seeking increased funding of primary care services, the CAH promises that the dollars will follow the patients. To those who believe that anything has got to be better than D.C. General Hospital, the CAH proposal offers the cover of an "anything." Because the CAH cannot work, in my judgment, every day that focuses on it as the main solution or as a serious possibility wastes a day of the limited time, staff resources, and political capital that are available to renew D.C. General Hospital. Money is wasted as well. The result will be need for a greater public subsidy to renew D.C. General Hospital. As the price tag for renewing the hospital rises, the political ability to secure it falls. As shown in Section II, closing D.C. General Hospital is not safe. As shown in Section IV, the Community Access Hospital scheme is not feasible and constitutes a reckless experiment. When the impossible choices are eliminated, the choice that remains is what must be done, however difficult it may appear. And whatever obstacles now stand in the way of renewing the hospital must be overcome through a combination of tough negotiation, intelligent program design, adequate transitional financing, and good hospital management. The alternative to renewing D.C. General Hospital, in my judgment, will be a forced closing that will threaten health care for many District residents who depend on D.C. General Hospital and who are vulnerable to deprivation of needed services. The closing would affect hospital care throughout the Districtfor all residents of the District. To avert this potential public health disaster, all stakeholders must commit themselves to renewing the hospital and then work together to accomplish that renewal. Otherwise, patients in need of care will suffer substantial harm. Political dangers would accompany the health care dangers. If D.C. General were to close early in 2001, it would embarrass the Districts government. It will present a difficult political problem to the new president. This embarrassment and this political problem will not be masked by finger pointing, or by contending that the hospital was too far gone to be saved. Prompt action now can and will renew D.C. General Hospital. To begin, eight over-arching strategic steps should be taken to renew and reform D.C. General Hospital. Go the distance. Return to the course originally charted in the first and second Cambio reports to the PBC. Those reports, which rested on the current management teams detailed analysis of the problems of the D.C. General Hospital, described eight sets of recommendations for renewing and reforming the hospital. While the job of validating or invalidating any specific recommendation offered by Cambio is beyond the scope of this report, they do appear reasonable, taken together. If some parties disagree with some aspects of the report, the sources of those disagreements need to be candidly addressed and an agreement struck. Avoid playing a numbers game. The number of beds that D.C. General Hospital will set up and staff next month, next year, and next decade will depend on patients need for care and their willingness to seek care at D.C. General. This, in turn, will depend on such factors as insurance coverage, available of care at other institutions, and patient preference. But these are not now very predictable. Under conditions of uncertainty, contingency planning is necessary. Otherwise, money will be wasted or patients will be denied needed care. The hospital must therefore develop a flexible staffing plan, one that can efficiently respond to the needs of the patients the hospital should serve. As discussed shortly, in the section on physical condition, I recommend that the hospital defer building a new physical plant until the existing hospital is renewed and reformed. This will allow time to estimate future need, and it will allow patients to vote with their feet to be served at D.C. General Hospitalif the hospital is renewed and reformed. Prepare a detailed reform plan. Writing a detailed reform plan is beyond the scope of this report. It is the job of the hospitals administrationthe people who will be charged with implementing it. The reform plan should build on the reports by Cambio and its consultants. Design and implement a plan to coordinate adequate primary care funding at the Districts clinics and health centers with the specialized ambulatory services, the inpatient care services, and the emergency room of a revitalized D.C. General Hospital. The Bureau of Primary Health Cares review of the PBCs health center program included a set of 20 specific recommendations to "improve operating efficiencies, expand its primary care base, expand related health services and improve the quality of care available to the Districts neediest citizens. "61 These recommendations rest on reviews of each health centers operations. As a set, they appear reasonable and useful. By some reports, the hospital may have begun to turn the corner financially. Cash is reported to be up by 150 percent from June to September. The hospital is billing for most of its services, though this needs to be extended to newly-licensed clinics. The "charge master" has been updated. High costs must be cut in appropriate and realistic ways. Design and implement a staffing plan that is commensurate with actual patient volume and with patient need for high-quality care. This will require cooperation among all parties, and willingness to work for the good of the patients the hospital serves todayand those who will need it tomorrow. The staffing plan must be pursued in a way that promotes the highest-quality care. The decision about which employees will staff the renewed hospital will rest on competence, effectiveness, and dedication to good patient care. This has implications for quality of care as well as cost. Protection for employees rights must be balanced fairly against the need to contain costs. All present protections were put in place to guard against real abuses. Today, the survival of the hospital will probably require overcoming both exploitation and barriers to appropriate staffing. Work rules, job descriptions, and other protections deserve scrutiny. If they raise costs unnecessarily, ways to guard against exploitation and to protect employees rights at lower cost need to be explored. Labor  management committees should take responsibility for negotiating this balance. That implies a cooperative style of management, one very different from the "us versus them" style that predominates at many hospitals. Goldsmith wrote that "frightened or angry people make awful partners in any new enterprise. "62 They would not be good partners in the struggle to renew and reform D.C. General Hospital. Fear that D.C. General Hospital may close could frighten and infuriate, or it could motivate and energize. Careful negotiation of relationships between hospital workers and hospital managementand provision of adequate resourceswill be vital to shift from fear and anger to motivation and energy. Assure a practical, workable nylon parachute for each employee who is laid off during the renewal process. At hospitals and other organizations, high-level executives routinely secure golden parachutes. Nothing like that is contemplated here. Rather, a full package of appropriate job training and placement servicesalong with severance pay commensurate with length of servicemust be offered if any downsizing is to be acceptable. One way to raise revenue is to serve more patients in need of care. Serving more insured patients will typically generate revenue that exceeds the incremental cost of care for those patients. Serving more uninsured patients enhances the hospitals legitimate claim on public dollars. Devote the dollars, training, and software to do whatever is necessary to bill to collect all the revenue the hospital deserves. Ensure that all hospital services are licensed and all hospital-affiliated sites are licensed, so that no payer can deny legitimate claims for patient care. Calculate and secure an appropriate subsidy from the District government. The hospitals subsidy needs for the 2001, 2002, and 2003 fiscal years should be calculated and guaranteed. Hospital management must make high-quality patient care the hospitals first objective. Management needs the authority and the flexibility to attract and retain the workers who are dedicated to attaining this objective. Renewing the hospital may require as much as three years, but it will appear rapid and stressful to the dedicated employees who are working for renewal. Appropriate support, training, technical assistance, and counseling in professional growth must be provided. Pay all physicians, nurses, and other hospital employees enough money to attract and retain highly-qualified, dedicated, and productive professionals. All newly appointed physicians should be board-certified or board-eligible. Consider which physicians should be retained full-time, without competing commitments, and which should be retained part-time. Some full-time physicians might split their days between the hospitals inpatient and ambulatory services, and a clinic or health centers primary care service. If D.C. General is to remain a teaching hospital, its teaching programs must be strengthened, to ensure that it attracts ever-more-competent and -dedicated residents each year. The turmoil and uncertainty that today cloud the hospitals future cannot be allowed to make it harder to attract good residents during the up-coming match between residents and hospitals. The hospitals future must be clarified in time to attract good residents, and appropriate guarantees must be provided. Medical records of the hospital and of ambulatory care sites should be integrated to enhance coordination and continuity of care. Undertake indispensable capital investments when needed, but consider big investments in physical reconfiguration or reconstruction only after the hospital is stabilized financially, medically, and politically. Prepare an affordable capital plan. A fully rebuilt D.C. General Hospital might seem vital to someto enhance both quality and efficiencybut the high cost of rebuilding now might block the hospitals medical renewal. A great number of things must be donemany more things than can be done at one time. The best should not be allowed to become the enemy of the good. Rebuilding should come later, not earlierwhen its cost could defeat or undermine reform and renewal of patient care itself. This means trimming costs through improved management, through staffing that is appropriate to meet patient needs, and through other reforms. It means harvesting all the revenue to which the hospital is entitled. It means improving quality of care in existing buildings. Other countries have shown that superb medical care can be provided in old and even run-down physical facilitiesespecially when the attractive prospect of a new building awaits as one appropriate reward for renewal. How many acute care beds should be operated? The CAH would have no ordinary acute care beds. Other proposals have contemplated building a new physical plant to house 110, 126, 140, 150, 165, 184, or more beds. It is useful to avoid a numbers game until the need for acute inpatient care at D.C. General can be measured carefully. That will not be possible until the hospital is renewed and reformed medically and financially. Only then will it be possible to meaningfully measure the hospitals attractiveness to patients and doctors. This is a second reason to postpone construction of a new building. A third reason stems from uncertainty about the survival prospects of other hospitals in the District. 110 staffed beds. This model, approved by the PBC board, would serve only as a transition to the CAH. Inpatient pediatrics, substance abuse, OB, NICU, nurseries would be closed. Adult medical-surgical beds and ICU would be cut. ER would be downsized by 15,000 try ER visits. Fully 20,000 patient-days would have to be provided at other hospitals, an average of 55 patients daily. Some 516 workers would be laid off. Inpatient pediatrics and substance abuse would be closed. 30 adult medical-surgical beds would be closed. 16,000 patient-days would have to be provided at other hospitals, an average of 44 patients daily. Some 300 workers would be laid off. The two-year deficit would be $114.1 million. Inpatient OB, nursery, NICU, and substance abuse would be closed. Some 380 workers would be laid off. The two-year deficit would be $98.6 million. Substance abuse care would be eliminated. 5,500 patient-days would have to be provided at other hospitals, an average of 15 patients daily. Some 270 workers would be laid off. The two-year deficit would be $89.6 million. No services would be eliminated. Some 240 workers would be laid off. 28,500 outpatient visits must be relocated to health centers. The two-year deficit would be $79.5 million. It does not seem possible, though, that only 165 beds are being and have been staffed this year on an average day. Average daily census will be lower during warm weather but it typically rises during the winter. If the hospital generates some 59,600 total discharges during calendar year 2000, as calculated earlier,66 that translates into an average daily census of 163 patients. But no hospital can be run at 98.8 percent occupancy. There is no elbow room to serve patients who need isolation, for separation of children, men, and women, and the like. Allowing for an efficient average occupancy rate of 85 percent yields a requirement for 192 beds to handle the average daily census of 163 (163/192 = 84.9%). This means, in conventional hospital parlance, that 192 beds need to be set up and staffed to serve an average of 163 patients. But if D.C. General Hospital is renewed and reformed along the lines suggested elsewhere in this Section, patient need and demand would be expected to be substantially greater than 163 patients on an average day. Improvements in the perceived technical quality of care at D.C. General Hospital and at the health centers. Improvements in the perceived receptivity to patient needs at D.C. General Hospital and at the health centers. Marketing D.C. General Hospital to greater numbers of insured patients. This would reduced fixed costs per admission, thereby improving efficiency of care for all patientsand also cutting the required public subsidy to serve uninsured patients, other things equal. Closing or downsizing of one or more of the hospitals that serve patients who could be expected to be displaced to D.C. General Hospital. The lower bed numbers examined in Dr. Newtons report do not seem to consider how many insured patientsor uninsured patients will remain at D.C. General Hospital or relocated to other hospitals. If uninsured patients are relocated elsewhere, the public subsidy required to finance their care must follow them or other hospitals will be reluctant to serve them. If insured patients are relocated elsewhere, D.C. General loses the revenue associated with their care. And fixed costs per patient-day rise as patient-days fall, increasing cost of care for the remaining patients, other things equal. The same observation applies to relocating ambulatory care services. Financial projections are never easy. Still, it is worth noting that the data included with Dr. Newtons memos indicate that the largest hospital discussed, with 165 beds, would incur the lowest projected two-year deficits. Fully developed financial projections must account for the range of reasonable contingencies that will affect demand for care at D.C. General Hospital and health centers, costs of operating the hospital and health centers, and third-party revenues generated by the hospital and health centers. An integrated plan for primary care and hospital services. Develop a concrete plan to integratein appropriate waysthe hospital with the clinics and with the health centers that refer patients to the hospital. The plan must specify financing, management, quality assurance, and mechanisms to ensure continuity and coordination of care. All residents of the District deserve immediately accessible and high-quality primary care. But primary care and hospital care are not alternatives. They must complement one another. Without adequate primary care, some problems are not prevented and others are detected later than they should be. Patients suffer. But without adequate back-up by appropriate specialist physicians, laboratory tests, diagnostic radiology, and inpatient hospital care, the problems that are identified by primary caregivers will not be treated adequately. Viewed in another way, a wheel needs both a hub and spokes. If either is lacking, the wheel falls apart. Those who hope that the CAH or even the closing of D.C. General Hospital will boost financing for clinics or health centers in the District may find that something very different materializes. Clinics serving large numbers of uninsured or Medicaid patients may find it more difficult to obtain referrals for specialty ambulatory care, for tests and diagnostic radiology, or for inpatient care. And the closing of D.C. General Hospital may prove to be the beginning of the Districts abandonment of direct financing of health services of any sort. Without D.C. General Hospital as a political mortgage on financing from the Districts government, primary care funding could be cut. That is, financing primary care can be sold today as a less costly alternative to hospitalization. But once the Districts obligation to finance hospital care for uninsured patients is eliminated or severely truncated owing to the closing of D.C. General Hospital, financing primary care will appear to be a more costly alternative to doing nothing at all. First, the foundation for good administration, free from city interference, was to have been laid in October of 1997, when a quasi-public Public Benefit Corporation took control of the hospital. It hasn't really accomplished what was intended. People in DC may therefore be somewhat disenchanted with what they might view as formal organizational change. Second, there has been some friction over the years about the right possible partner. Howard is the logical one in many respects (such as mission) but we don't seem to be close to unanimity on who might merge with or take over DCGH. Third, any formal changes would take a great deal of time to debate. The hospital probably has six months of money left, as things stand. Fourth, potential partners don't seem to trust the District government, or Congress, well enough to take on the hospital in the absence of solid assurances of adequate continuing subsidy for cost of caring for uninsured patients. It will therefore be necessary to focus on renewal from within, with the Public Benefit Corporation and mayor agreeing to give a solid and trusted CEO a much freer hand. This will require a real, shared commitment to save the hospital, and a willingness to mobilize resources and allow thorough reform quickly. Renewing and reforming D.C. General Hospital. In a time of crisis, Americans pull togetherwhether in war or natural disaster. Unless D.C. General Hospital is renewed and reformed, the people of the District who rely on this hospital may suffer a public health disaster. It is possible to prevent that disaster. It is possible to overcome D.C. Generals cost, revenue, quality, physical plant, and other problems. But only if all parties make whole-hearted commitments to doing what is necessary, and then fulfill their commitments. And only if required transitional investment funding and ongoing uncompensated care subsidy funding are secured. Note: As mentioned in the text, these estimates do not reflect possible offsetting savings from greater productivity of attending physicians, from streamlined patient care, or from improved staffing. These savings are likely to be substantial, but probably not sufficient to offset the costs of replacing residents at this time. Alan Sager is a professor of health services at the Boston University School of Public Health, where he has taught since 1983. He serves on the Massachusetts Attorney-Generals Advisory Group on Health Care Reform, and on the state Secretary of Health and Human Services Working Group on Health Care Finance. He holds a B.A. in economics from Brandeis and a Ph.D. in city and regional planning (specializing in health care) from MIT. This report rests in part on his 27 years of investigations into hospital closings, hospital survival techniques, and reshaping hospital care in 52 U.S. cities (including Washington, D.C.) from 1936 to-date. 1. See, for example, Cambio Health Solutions, Recommendations [to Public Benefit Corporation] for Phase II, Executive Summary, May 2000, pp. 3-18 (draft). 2. Response to the Medical and Dental Staff Section of the Cambio Phase II Report, transmitted by Michal Young, Interim President, medical and Dental Staff, D.C. General Hospital, 20 June 2000. 3. District of Columbia Hospital Association, Utilization Indicators, Calendar Year 1999, Washington: The Association, 2000, http://www.dcha.org/99Utilization.PDF. 4. Winston S. Churchill, 11 November 1947, speech, House of Commons. 5. Public Benefit Corporation, Primary Health Care Services Assessment, 2000, n.d. indicated. 6. Barbara A. Ormond and Randall R. Bovbjerg, The Changing Hospital Sector in Washington, D.C.: Implications for the Poor, Washington, The Urban Institute, 1998, p. 29. 7. Public Benefit Corporation, Primary Health Care Services Assessment, 2000, n.d. indicated. This is a report prepared by or resting on evidence compiled by "a multidisciplinary team of consultants with extensive primary care and systems management expertise," hired by the Bureau of Primary Health Care, Health Resources and Services Administration, United States Department of Health and Human Services. 8. Author's calculations from Public Benefit Corporation, Primary Health Care Services Assessment, 2000, n.d. indicated. 9. Avram Goldstein, "Ax Falls on 296 at D.C. General," Washington Post, 30 September 2000. 10. Public Benefit Corporation, Primary Health Care Services Assessment, 2000, n.d. indicated. This is a report prepared by or resting on evidence compiled by "a multidisciplinary team of consultants with extensive primary care and systems management expertise," hired by the Bureau of Primary Health Care, Health Resources and Services Administration, United States Department of Health and Human Services. 11. District of Columbia Hospital Association, "General Information about Patients Served at D.C. General Hospital, 1999," Washington: The Association, Patient Data System Information, n.d.
12. Calculation from District of Columbia Hospital Association, "General Information about Patients Served at D.C. General Hospital, 1999," Washington: The Association, Patient Data System Information, n.d.
13. Public Benefit Corporation, Primary Health Care Services Assessment, 2000, n.d. indicated. 14. Testimony of Mr. Natwar Gandhi, chief financial officer, District of Columbia, testimony before the Subcommittee on Health and Human Services hearing on D.C, General Hospital, 18 September 2000. 15. See Avram Goldstein, "Ax Falls on 296 at D.C. General," Washington Post, 30 September 2000. 16. Public Benefit Corporation, Primary Health Care Services Assessment, 2000, n.d.indicated. 17. D.C. General Hospital Transition Task Force, Systems/Models Work Group, summary of 29 September 2000 meeting. 18. Barbara A. Ormond and Randall R. Bovbjerg, The Changing Hospital Sector in Washington, D.C.: Implications for the Poor, Washington: The Urban Institute, 1998, p. 26. 19. Alan Sager, compilations of American Hospital Association data on hospital beds, published in the Guide issues of the Journal of the American Hospital Association, 1946 and 1950. 20. Barbara A. Ormond and Randall R. Bovbjerg, The Changing Hospital Sector in Washington, D.C.: Implications for the Poor, Washington: The Urban Institute, 1998, p. 26. 21. Alan Sager, Hospital Closings and Other Reconfigurations in 52 U.S. Cities, ongoing study. See, for example, Alan Sager, "Why Urban Voluntary Hospitals Close," Health Services Research, Vol. 18, No. 3 (fall 1983), pp. 451-475; Alan Sager and Deborah Socolar, "Urban Hospital Closings, Relocations, and other Reconfigurations," American Public Health Association, New York, 18 November 1996; and Alan Sager, Deborah Socolar, and Jasprit Deol, "Causes of Hospital Closings in 52 Cities," American Public Health Association, Indianapolis, 10 November 1997. 22. Telephone conversations with emergency room personnel at Washington Hospital Center, George Washington University Hospital, and Providence Hospital, 17 September 2000. 23. Data from the 2000 census are not yet available. 24. District of Columbia Hospital Association, Utilization Indicators, Calendar Year 1999, Washington: The Association, 2000, http://www.dcha.org/99Utilization.pdf. 25. Barbara A. Ormond and Randall R. Bovbjerg, The Changing Hospital Sector in Washington, D.C.: Implications for the Poor, Washington: The Urban Institute, 1998, p. 2 and Table 5 (p. 14). 26. District of Columbia Hospital Association, 1999 DCHA Annual Hospital Survey. Columbia Hospital for Women and Hadley Memorial did not report uncompensated care for 1998. We conservatively estimated their uncompensated care at reported 1999 levels. 27. For 1999, see District and Columbia Hospital Association, Utilization Indicators, Calendar Year 1999, Washington: The Association, 2000, http://www.dcha.org/99Utilization.pdf, p. 9. For 2000, see PBC, DC General, "FY2000 Annualizaed Patient Days," extrapolated from the experience from 1 January 2000 through 21 September 2000, PBC spreadsheet. 28. Author's calculations from U.S. Census Bureau, "State Population Estimates: Annual Time Series, July 1, 1990 to July 1, 1999," Census Publication ST-99-3, http://www.census.gov.population/estimates/state/st-99.3.txt; U.S. Census Bureau, "Health Insurance Coverage, 1998," Series P60-208, Issued October 1999, Table 2; and U.S. Census Bureau, "Health Insurance Coverage, 1999," Series P60-211, Table D, Issued September 2000, http://www.census.gov/hhes/hlthins/hlthin99/hi99te.html. 29. Donald S. Shepard, "Estimating the Effect of Hospital Closure on Aerated Inpatient Hospital Costs: A Preliminary Model and Application," Health Services Research, Vol. 18, No. 4 (Winter 1983), pp. 513-549. 30. Calculated from David A. Woodwell, "National Ambulatory Medical Care Survey: 1996 Summary," Advance Data from Vital and Health Statistics of the Centers for Disease Control and Prevention/National Center for Health Statistics, Number 295, December 17, 1997, Table 2; Linda F. McCaig and Barbara J. Stussman, "National Hospital Ambulatory Medical Care Survey: 1996, Emergency Department Summary," Advance Data from Vital and Health Statistics of the Centers for Disease Control and Table 1; and Linda F. McCaig, "National Hospital Ambulatory Care Survey: 1996 Outpatient Department Summary," Advance Data from Vital and Health Statistics of the Centers for Disease Control and Prevention/National Center for Health Statistics, Number 294, December 17, 1997, Table 1. 31.Barbara A. Ormond and Randall R. Bovbjerg, The Changing Hospital Sector in Washington, D.C.: Implications for the Poor, Washington: The Urban Institute, 1998, p. 2. 32. Barbara A. Ormond and Randall R. Bovbjerg, The Changing Hospital Sector in Washington, D.C.: Implications for the Poor, Washington: The Urban Institute, 1998, p. 32. 33. District of Columbia Hospital Association, Financial Indicators, Fiscal Year 1998, Washington: The Association, Fall 1999, p. 2. 34. District of Columbia Hospital Association, 1999 DCHA Annual Hospital Survey. 35. Public Benefit Corporation, District of Columbia, "Community Access Hospital," Draft, 11 September 2000, p. 6. 36. "Second-class Medicine," Consumer Reports, September 2000. 38. This is only 81.1 percent of the 3,072 beds that are called "operating beds" in District of Columbia Hospital Association, Utilization Indicators, Calendar Year 1999, Washington: The Association, 2000, http://www.dcha.org/99Utilization.pdf, p. 2. 39. U.S. Census Bureau, State Population Estimates: Annual Time Series, July 1, 1990 to July 1, 1999, Census Publication ST-99-3, http://www.census.gov.population/estimates/state/st-99.3.txt. 40. For calculations that demonstrate this problem, see Alan Sager and Deborah Socolar, Massachusetts Should Identify and Stabilize All the Hospitals Needed to Protect the Health of the People, Testimony on H. 781 and H. 2698, Health Care Committee, Massachusetts General Court, 20 May 1999. 41. Anita Lienert, "Mercy Patients Left Adrift after Closing: St. John's Hit by Crush of New Medicaid Cases," The Detroit News, 26 June 2000. 42. Public Benefit Corporation, District of Columbia, "Community Access Hospital," Draft, 11 September 2000. 43. Testimony of Mr. Natwar Gandhi, chief financial officer, District of Columbia, testimony before the Subcommittee on Health and Human Services hearing on D.C. General Hospital, 18 September 2000. 45. Other items could be added, such as developing for detecting problems in contractors' compliance with their agreements to serve patients displaced from D.C. General Hospital, and methods of enforcing compliance speedily. 46. Ivan Walks, D.C. Commissioner of Health, statements in response to questions, D.C. City Council, Subcommittee on Health and Human Services hearing on D.C. General Hospital, 18 September 2000, emphasis added. 47. Public Benefit Corporation, District of Columbia, "Community Access Hospital," Draft, 11 September 2000, p. 2. 48. I was not able to contact anyone in Illinois to verify claims regarding freestanding emergency rooms in that state. 49. See INOVA's web sites, particularly "INOVA Emergency Care Center," http://www.inova.com/beyond/iecc.htm. 50. American Hospital Association, AHA Guide to the Health Care Field, 2000-2001 Edition, Chicago: The Association, 2000. 51. Data compiled by the Virginia Hospital and Healthcare Association. I am grateful for help from Mr. William L. Murray, Vice President, Virginia Hospital and Healthcare Association. 52. For background on Germantown Hospital and Albert Einstein Medical Center, I relied in part on information provided by Andrew Wigglesworth, President, Delaware Valley Healthcare Council, Philadelphia, telephone conversation, 15 September 2000. 53. Information on the two Illinois facilities was provided by Mr. Ron Damasauskas, Illinois Hospital Association, telephone conversation, 20 September 2000. 54. Please note that the information on the two Illinois facilities was not available in time to prepare the written testimony submitted on Monday 18 September 2000. It is added here to round out the record. 55. "Limited ERs Can Be a Lifeline When Hospitals Close: N.J. Moves to Save Emergency Facilities," The Times of Trenton, 22 May 2000. 56. Rod Wiggins, Medimetrix Consulting, Review of Models 1 & 2, presentation prepared for the Public Benefit Corporation: District of Columbia Hospitals, 25 August 2000. 57. Rod Wiggins, Medimetrix Consulting, Review of Models 1 & 2, presentation prepared for the Public Benefit Corporation: District of Columbia Hospitals, 25 August 2000. 58. Reflecting the views of "more than one observer." See Barbara A. Ormond and Randall R. Bovbjerg, The Changing Hospital Sector in Washington, D.C.: Implications for the Poor, Washington: The Urban Institute, 1998, p. 39. 59. Robert A. Malson, "Testimony before the Committee on Human Services of the Council of the District of Columbia," 18 September 2000, p. 5. 60. Testimony of Mr. Natwar Gandhi, chief financial officer, District of Columbia, testimony before the Subcommittee on Health and Human Services hearing on D.C. General Hospital, 18 September 2000. 61. Public Benefit Corporation, Primary Health Care Services Assessment, 2000, n.d.indicated. 62. Jeff C. Goldsmith, "Driving the Nitroglycerin Truck," Healthcare Forum Journal, March 1993. 63. On request, the author will provide the documentation for each element of the table. 64. For 1999, see District of Columbia Hospital Association, Utilization Indicators, Calendar Year 1999, Washington: The Association, 2000, http://www.dcha.org/99Utilization.pdf, p. 9. For 2000, see PBC, DC General, "FY2000 Annualized Patient Days," extrapolated from the experience from 1 January 2000 through 21 September 2000, PBC spreadsheet. 65. See, for example, "Possible Models for Consideration," memorandum from Robin Newton to Planning Committee and PBC Board of Directors, 27 September 2000, with revised version of 2 October 2000. 66. For 1999, see District of Columbia Hospital Association, Utilization Indicators, Calendar Year 1999, Washington: The Association, 2000, http://www.dcha.org/99Utilization.pdf, p. 9. For 2000, see PBC, DC General, "FY2000 Annualized Patient Days," extrapolated from the experience from 1 January 2000 through 21 September 2000, PBC spreadsheet. 67. On request, the author with provide the documentation for each element of the table.